The bow of the Belgian trawler bears the traces of the ramming for which she is responsible. Deborah cut like a blade the left side of the Hav Britannica. The 4 hold hatches went adrift, several tons of fuel too. From the very first moment, under French jurisdiction waters were at risk. At the time, the regional and professional press unanimously relying on official sources wrote that it was too late for a towing of the overturned wreck of the Maltese cargo ship. 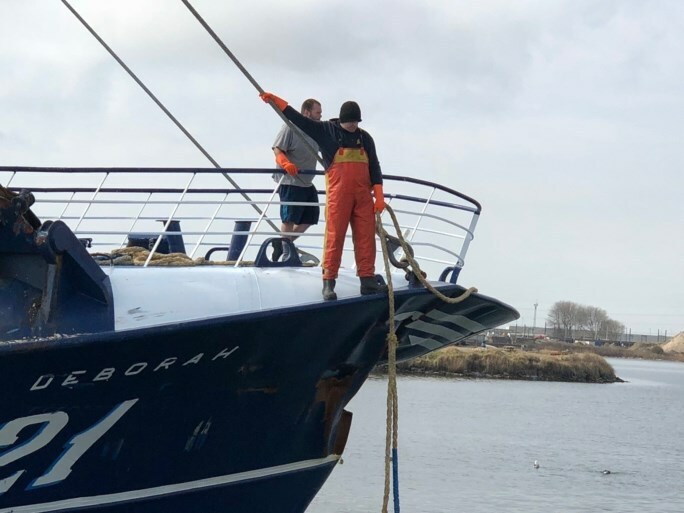 Fortunately, the maritime prefecture of Manche-Mer du Nord subsequently changed its mind and called upon the competence of the salvage tug Abeille Liberté. However, the Belgian trawler has not been re-routed in a French port. It could have lead to the discovery on board of an electric trawl or non-compliant mesh sizes or even plaices, soles or cods under legal size as in the holds of certain Dutch trawlers. These looters were regularly intercepted by the French Maritime Affairs in the North Sea and diverted to Dunkirk from where they could leave only after the payment of a guarantee guaranteeing the representation at the trial of the shipowner or his representatives.